Three years ago, this was just a dream. And a bloody unrealistic one at that. Or so I thought. I was bored and miserable in a government job, but the idea of quitting to travel or follow my passions of nutrition shared the sh** out of me. This exercise is something I learned a few years ago, and I’ve been doing it regularly ever since. It changed my life. It got me here, in the rice paddies of Bali, living out my passions for travel, nutrition AND yoga. It’s the ‘Perfect Day Exercise’. I want you to think about your perfect day. I’m not talking about your perfect day on holidays or a Saturday, I’m talking about your perfect EVERYDAY. Like, a Monday or a Tuesday (so you’re probably going to be working at some point during that day). You need to figure out what and who is important to you and how you’re going to fit that into your perfect day. Some of us are so disconnected from what we really want, so this is a great exercise to take some time out and really connect to our dreams and desires - and start making them actually happen! So get out a piece of paper and follow along with me. Write down ‘ideal morning routine’. What actions are you taking on your ideal day to set you up for an awesome day? For me, on my perfect average day - I wake up at 6am, naturally, without an alarm. I’m feeling awesome and energised. I meditate for 20 minutes lying in bed, and then I get up and walk to my yoga class. Then I meet my boyfriend in a cafe for a coconut latte and healthy breaky (probably smashed avo like a good little millenial) and I spend a couple of hours working from the cafe. See the language I’m using here? Treat it as if it’s something you’re already doing, not just a distant dream. Next, it’s time for some work. Write down ‘perfect working day’. I want you to dream big here. If you hate your job or it’s just ‘meh’ - think about your dream job or maybe you’d like to start your own business. Who would you want to be helping in your dream job or business? How would you want to contribute? In my perfect day, I’m helping people get their energy back and live on purpose, with online programs, one on one coaching and yoga classes. So I head to a coworking space to be surrounding by an inspiring bunch of people, and run my group program and have Skype sessions with one:one clients. Then I sit outside and have a healthy lunch. I do a bit more work and then head off to teach a yoga class. You get the picture. This is going to look different for you. We want this to be as clear as possible. What do you dream of doing in the evenings? Write down ‘perfect evening ritual’. Maybe you want to cook yourself or your family a healthy dinner, or maybe you go out to dinner with friends. You could be painting, or playing the ukulele or touch footy. Whatever floats your boat, it’s completely up to you. And when do you go to bed? For me it’s nice and early, so I can wake up bright and early to crush the day. This is all about connecting to what we really want. Once we can connect, we can start to actually take action to move towards our dream lives. And you know what, you have NOTHING TO LOSE! So just give it a go! 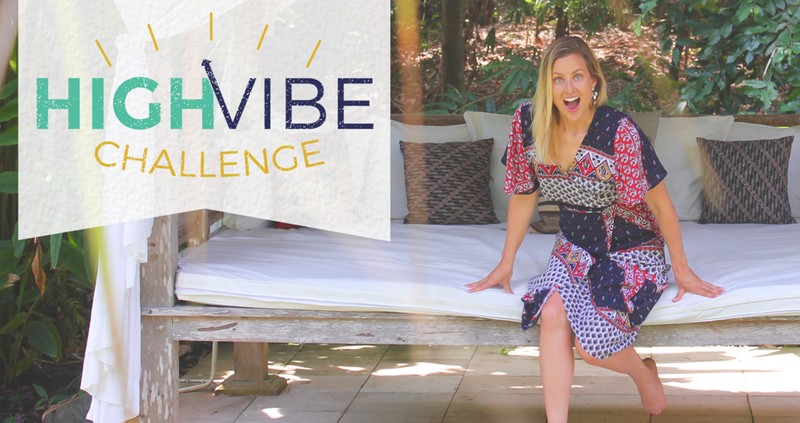 If you’re ready to start living your most legendary life, join the FREE 5 day High Vibe Challenge which kicks off on 2 October 2017. Click the button below to save your spot!